The standard JS Array.map applies some function to every item in a list, one by one, returning a new, transformed Array - the order and structure of which is preserved. Here is a more generic map, which applies some function to every item in a TP outline, returning transformed/derived contents in a preserved outline structure. If we give it a function (from a TP Item to some value), and a particular TP Item, it applies the given function both to that Item, and to all of its descendants, returning a generic Tree structure, which has the same shape (same pattern of parents and children) as the TP Outline. 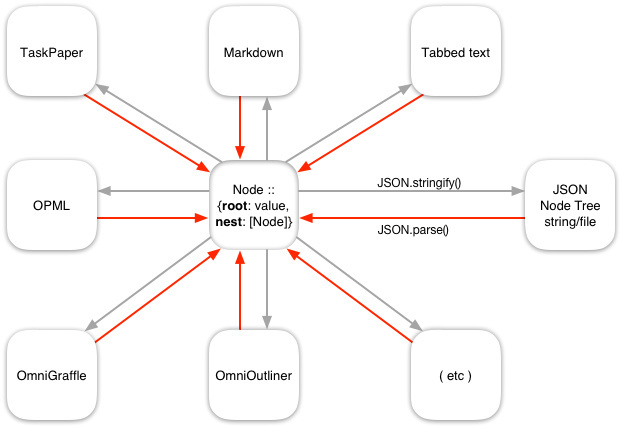 (Every item in the Tree is a Node, which has a root (some kind of value like a string or number or JS dictionary – created by the function which we supplied), and a nest, which is a list of child Nodes. I personally use this generic Tree pattern as a hub format, for conversions between outlines and nested diagrams etc. A generic Tree -> OPML function for the second stage. (a, k) => [ // Tags and values except 'type' + 'indent'.